September 8, 2017 SoftBank Corp. Sprint Corporation Far EasTone Telecommunications Co., Ltd. TBCASoft, Inc.
Japan-based SoftBank Corp. (“SoftBank”), U.S.-based Sprint Corporation (“Sprint”), Taiwan-based Far EasTone Telecommunications Co., Ltd. (“Far EasTone”) and U.S.-based TBCASoft, Inc. (“TBCASoft”) today announced the launch of a new blockchain consortium, the Carrier Blockchain Study Group (“CBSG”). In the future, more telecom carriers will be invited to participate in the CBSG on a global scale. SoftBank, Sprint and TBCASoft also succeeded in demonstrating a cross-carrier payment platform system that uses TBCASoft's innovative blockchain technology. In February 2017, SoftBank, Sprint and TBCASoft agreed to aim to cooperate in jointly developing blockchain technology for telecom carriers, and commenced a technical trial that connects TBCASoft's blockchain platform to telecom carriers' systems. With Far EasTone newly joining this association, it since developed into a consortium that aims to build a next-generation global cross-carrier blockchain platform and ecosystem. CBSG will promote research and development for the platform with the aim of providing users various services such as secured clearing and settlement, personal authentication, IoT applications, and other services in the future. SoftBank, Sprint and TBCASoft succeeded in demonstrating cross-carrier top-ups 1 , mobile wallet 2 roaming, international remittances and IoT payment on a cross-carrier payment platform system using TBCASoft's blockchain technology that can be integrated with telecom carriers' existing systems. TBCASoft's technology enables a highly secure and versatile global blockchain platform system that can be operated 24/7 at low cost. TBCASoft will be introduced at Sprint's booth at Mobile World Congress Americas, held from September 12 to 14 in San Francisco. The project connects carriers' telecommunication backend systems. The system eliminates late transactions or transaction failures between telecom carriers. Not only can the system significantly improve existing business operations, but more importantly it also enables various business opportunities for telecom carriers. “TBCASoft is developing a cross-carrier distributed ledger network consisting of telecom carrier hosted servers running the TBCASoft blockchain platform. 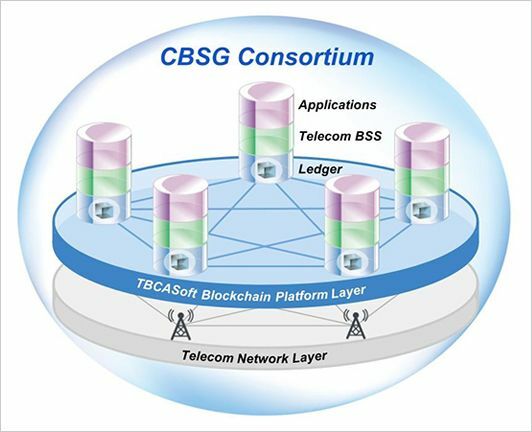 We aim to work with global telecom carriers to build a very secure and high-performance blockchain system where disruptive services can be ubiquitously provided to billions of telecom carrier subscribers worldwide.” said Ling Wu, Founder & CEO of TBCASoft, Inc.
“TBCASoft has a sophisticated layered system architecture, SoftBank can successfully integrate our Business Support System and Mobile App servers with TBCASoft blockchain platform in a short period of time at a reasonable cost. SoftBank is satisfied with confirming the implementation and system performance of the TBCASoft's blockchain platform on which value transfer service led by telecom carriers will be operated.” said Mr. Takeshi Fukuizumi, Vice President of SoftBank Corp.
“CBSG is leading the telecommunication industry's understanding and development of blockchain technology. The disruptive potential of blockchain on a global scale will be fully realized when carriers work together and leverage the new platform and ecosystem.” said Doug Garland, Sprint Vice President of Innovation and Partnerships. “Mobile payment has a huge demand in Asian market, including Taiwan. The TBCASoft blockchain platform provides the solution to reshape the competition in this new business territory by having carriers work together on a distributed ledger system. More importantly, through CBSG Consortium, carriers can join together to fully exploit the potential of blockchain technology for providing global services.” said Mike Lee, Executive Vice President of Far EasTone. *2 A digital wallet that users can make payment transaction on a mobile device. Users can make payments in merchant stores and settlement through their wallet. Far EasTone Telecommunications (FET) is a leading company in Taiwan that provides telecommunications and digital application services. FET honors “Trustworthy, Agile, Innovative, Collaborative” as its core values. Since its inception in 1997, FET has continued to introduce new products and services utilizing access technologies, including 2G, 3G, 4G, 5G, Wi-Fi, and the first telecom operator in Taiwan to start operating 4.5G/LTE on 2,600MHz band. FET proceeds the pursuit of customer satisfaction and strengthens vertical integration of the ICT industry and secure enterprise cloud services for the business community. TBCASoft, Inc. is a US-based start-up company developing a consortium-based blockchain platform specifically for telecommunication industry. TBCASoft is teaming up with the top global telecommunication leaders to build the most secure, robust, and scalable cross-carrier blockchain platform to serve the needs of the future in the mobilized world. The platform connects global mobile carriers to create a boundaryless ecosystem providing unified trust to billions of mobile users worldwide. TBCASoft is building this trust to change the world.